On 9th January 2017 Transactional Analyst and my personal hero, Claude Steiner, died with the words ‘love is the answer’ floating on his last breath. Here is a memorium. This sentiment, this death and this beautiful truth affected me profoundly and deeply catalysed some life changing decisions which I took immediate action on. As I write this today, 9th January 2019, my life is unrecognisable, so different it is from the life I once lived. My journey didn’t start here however, this was the beginning of the end and the start of my most authentically re-designed life. For context, let me take you back to 12th August 2014. This was the day I heard Robin Williams had ended his life. The day of my then partner’s birthday which we had celebrated as part of a narrow boat holiday with some (then) friends. This day, in a drunken depressive mess, in the middle of the night, in a narrow bed on a narrow boat living a life so narrow I believed it might strangle me, I decided to end my life. This decision was not as unwise as it sounds, but it was as drastic and as certain. What was new was that I didn’t mean I wanted to die. In that moment, I chose to live. Differently. I felt myself understanding at the deepest and surest part of me that my life as it was was utterly unsustainable. I was miserable, fat, childless, grieving, lonely, frightened, shut down, closed off, fake, defended, alcohol dependent (for the numbness) and hopeless. I had flirted with the idea of my own premature death since I was in my early teens. As a lesbian being raised in a family which expected me to grow out of being me and marry a (male) lawyer, have kids and live a steady life which would give them something to boast of with their friends and make them proud. I’d struggled with depression, shame and a tendency to hide my vulnerability by eating too much, drinking too much and shutting down my feelings for as long as I could remember. I survived by hiding. I died a little every day because of the hiding. Since early childhood, I had developed a disabling pleasing habit, pleasing everyone but myself. Meaning I would distort myself to please others, I would work too hard, travel too far, accept too little and too much, smile too broadly and cry too hard in secret. Being false, hiding my truth and my vulnerability, being strong and pleasing other people and never myself was my modus operandi. I had married a person I loved (and still do) dearly, but who was about to transition from being the woman I believed him to be when we had met into the man he had understood he really was. It was all about supporting him and putting aside any thoughts of my own needs and fulfillment. I loved him. That would see me through, wouldn’t it? And with this devastating choice to discount myself in order to stand by my man, I turned away firmly and finally from what (now) matters most, my loving relationship with me. The revelation that my life as it was must end, thanks in part to the dear and deceased Mr Williams, freed me from the misery and shame of being me. It felt like a secret gift I received from my truest self. Here was what I understood in the dark and gloom of that magical night, I didn’t have to die and I didn’t have to live like this. I could and I would find a way to transform my life, to be truly me, to stop hiding and to connect with other people who would love me for the beautiful creature I had quite suddenly remembered I was. At this moment of enlightened clarity, I felt a joy I had not accessed since my very early life when everything felt simpler and I had hope. I held that hope close and I knew that one day I would show up for myself in a way I never had. And so my life went on and I held this secret joy close to my dark and closed down heart knowing that one day, my time would come and I would somehow end this and re-design the landscape of my life. But first, I needed to build my understanding of my worth and value. I had been accepted to a Phd programme where I would research gender and autism (my then husband’s story) when he begged us to go into couples therapy because I was becoming ever more distant from him. I decided to find a therapist for myself rather than share my suffering with him (typical of my pattern back then). It was here I understood that I was focusing literally everything I had on other people, away from myself and with this my journey home to me began. So I pulled out of the Phd and enrolled on a foundation year in Transactional Analysis and started to get to know myself within the beauty of this simple and relatable theory. I progressed into advanced clinical training as a psychotherapist, as a Transactional Analyst, and I continued in my own weekly psychotherapy, journeying ever closer to my core. In 2016, I qualified as a personal and business Coach and finally connected with how totally inappropriate I felt around describing myself to undeserving, good and authentic people with lies, so many lies about me; as a woman with a husband, leaving them to assume my heterosexuality, my married bliss and my happy life, as a Head of Learning and Development, another part of my life which did nothing to describe or define my loves and interests, my passions; I was utterly unfulfilled in all aspects of my life and becoming unable to pretend any longer. I was reaching a point in my self awareness and development journey where I was uncomfortable in sustaining this. And I couldn’t forget my heart’s secret, that I would someday live in a new way. I understood I was growing close to this time. And then Claude Steiner died and said what he said as he did so and the final layer of my defence broke and I broke and I also mended, all at once. The very next week, I finally entered couples therapy with my husband and spoke the words I hadn’t been able to for all the years that came before. He was devastated and the part of me which existed to please him and all others snapped and I knew, because I had, that I could act from my deepest truth and that ultimately, all would be well. Love really is the answer and the act of leaving a man I couldn’t love in the way he deserved was love. The act of honouring my truest identity was love. The sense of relief that I had finally shown up for myself was love. The act of putting my own oxygen mask on first was an act of love. Love is, of course, the answer. This ending left me uncomfortable to share a home with someone I had hurt so deeply and so I became nomadic (I wasn’t strictly homeless, but y’know) and in this I placed myself into a new way of living and of relating where I asked for help and support and care and nurture and I was delighted to receive it from my true friends and from some of my family. Some relationships I had hidden within and from suddenly became real and raw and true and my being real and showing myself muscle began to grow. I also decided it was my time to become the mum I had always yearned to be (and put lots of years and money into); I asked a precious young lesbian who I loved and had for a few years been nurturing, looking out for and taking care of if they would allow me to adopt them. Their birth family had abused and then rejected them so I knew we both had a need the other could fulfil, and I did in a lovely ceremony surrounded by people who understood. Next I left my job; I did this with love for the organisation and for the people I had worked together with for over ten years. Doing this was an act of love, I created space for them to evolve. I created space for me to evolve and I left in a truly loving way with a contract for a year of consultation with them from my new company which I set up as soon as my employment contract came to an end. It’s called Autonomy Development. Then I left my ways with food and alcohol and being seen; I re-decided the ways I used them to numb and hide and I re-decided the ways I show up. You can now see videos and photos of me on my facebook page, Instagram and Twitter. They start just after I learned that love is the answer. I have changed the way I show up for myself and for you. Shortly after falling deeply and irreversibly in love with myself, I fell in love with my lover. My lover wakes me every morning with coffee and cuddles. She kisses me hundreds of times each day. Listens to me endlessly. She shares herself with me unfiltered. Holds me tight. She supports every idea, thought and feeling I express. She treasures me. I deserve this. In February 2018, I moved into my cozy cottage and made a delightful home for me. I soon rescued a cat and a dog. Got wood burning stoves and bookshelves and hunkered down to rest and recover and emerge further and fuller into this raw and true new way of living from a place of love. I have changed the way I stand up and be me. Now I have changed my understanding of my own importance. Now I have changed the way I love and honour my own existence. Still, I am far from being a finished product. I am a flawed and imperfect human who trod a complex and messy path to get to a point where I am confident to be authentically me most of the time. I am delighted with the truth I live, with the life I have made from the love I have for myself. Eat, drink, sleep and rest in the way you truly need. Your body and mind will thank you. 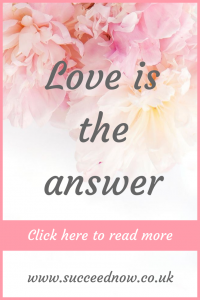 Love is indeed the answer. Lucy Power, Therapeutic Coach and superhero. Are you ready to take control of your life and feel free from anxiety? Its time to build your confidence and live the life you deserve. Get all the support and resources you need in one place with the Mindset Mastery. Click here to read more. Lucy Power is a qualified Coach who is extensively trained in Transactional Analysis for Psychotherapy and for Organisations. Lucy has worked in support of personal change (as a Youth Worker, Social Worker and senior leader in the care sector) for others. Now for herself for well over twenty years and has funnelled her knowledge, skills and experience into her unique coaching offering. She works with groups and individuals to get them in touch with love for themselves and their world. Transforming the way they get their needs met and how they relate to themselves and others.